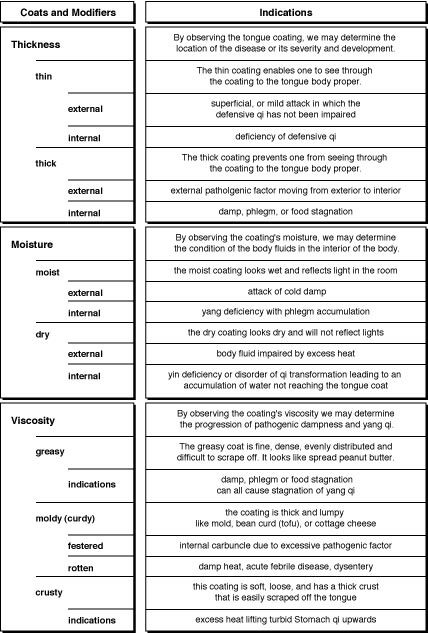 Indications associated with tongue coating thickness, moisture, and viscosity. the progression of pathogenic dampness and yang qi. difficult to scrape off. It looks like spread peanut butter. the condition of the body fluids in the interior of the body. location of the disease or its severity and development. the coating to the tongue body proper. This page links to sample charts from the Traditional Chinese Medicine Diagnosis Study Guide by Yi Qiao, L.Ac., and Al Stone, L.Ac., DAOM. Buy it now or check out the sample pages at Eastland Press.